Discussing the area of diet in me/cfs and the role of nutrition. This curry is so easy and really warming and filling! You want to cook this in a super big pan if it’s not going in a slow cooker. This creates about 4/5 portions. You can add a couple of diced chicken breasts, if eating meat. Additional sprinklings of paprika, garlic salt, cumin, turmeric, cayenne pepper, (make it as hot as you like). 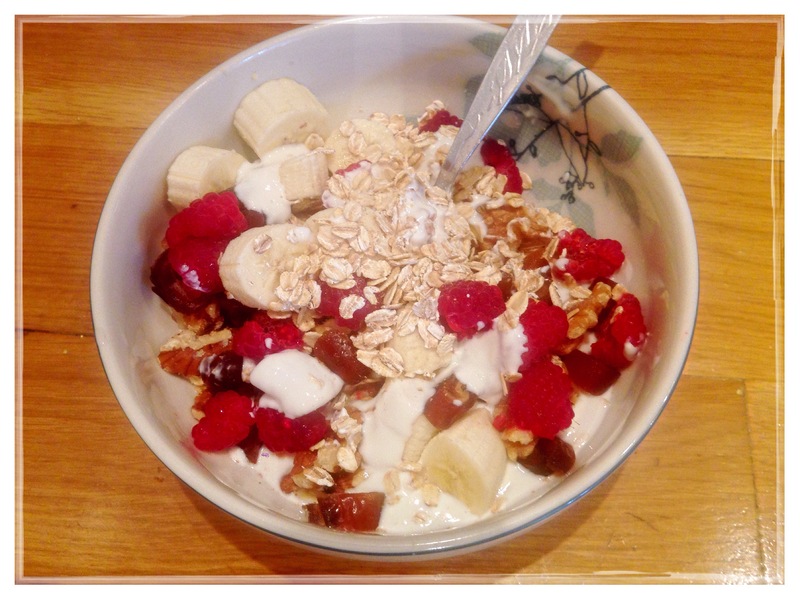 A taste of fruity, natural heaven, this simple muesli is so fresh and filling. A great way to start the day. Just dice all the fruit and mix up the remaining ingredients with the yogurt. Then enjoy! Playing with my new slow cooker, I made a favourite all orange ingredient, soup of mine and it was fun to just let it simmer away all morning. In fact in only took around three and a half hours until it was ripe for the hand blender. This recipe has evolved each time I’ve made it, and today I think it’s reached the peak of flavour. It’s a thick, harty soup for cold days and hungry tummy’s. Peel and chop veg and add to either your slow cooker or very large soup pan, (if using soup pan you may need to top up the stock water a little more). You can play with adding more spice or coconut milk to make hotter, or cool it down again with the milk. Serve with a swirl of coconut milk, dash of spice ontop and eat with bread. Alternatively, because it has a chunky Indian taste, a nan bread or chapati may be nice for dipping. 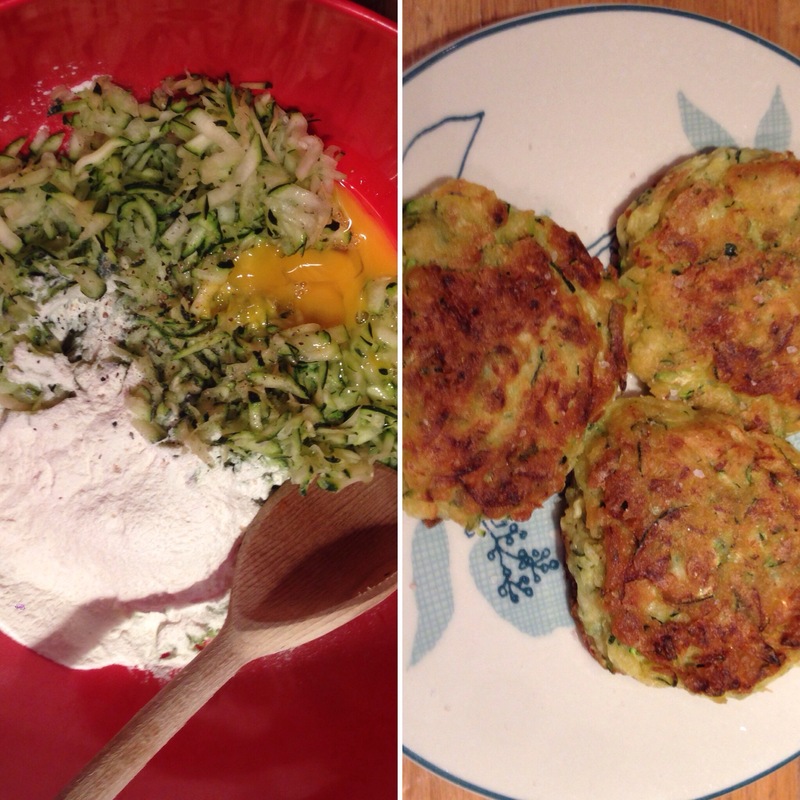 Courgette fritters – Wheat free! A great and quick way to use up your veg and also get some lunchtime protein is to have a fritter, mmm! You can also make it vegan by using a chia seed alternative to eggs, see below. There are only three staple ingredients and it takes minutes to make. 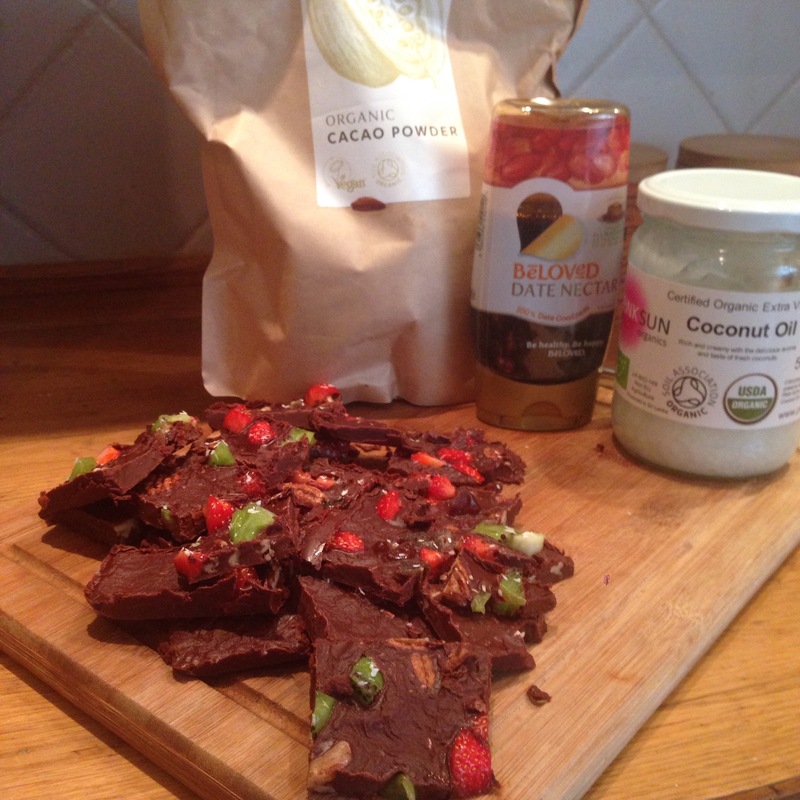 First time making healthy homemade chocolate today, and it’s rather gorgeous! Just three staple ingredients needed. It’s so totally easy, so get cracking and make some if you haven’t yet tried the experience. The raw fruit does make it a little wetter but I didn’t mind imperfect slices and I liked having fresh fruit combined. If you want firmer slices then use dried fruit and nuts only. You could also up the amount of chocolate for thicker chunks. 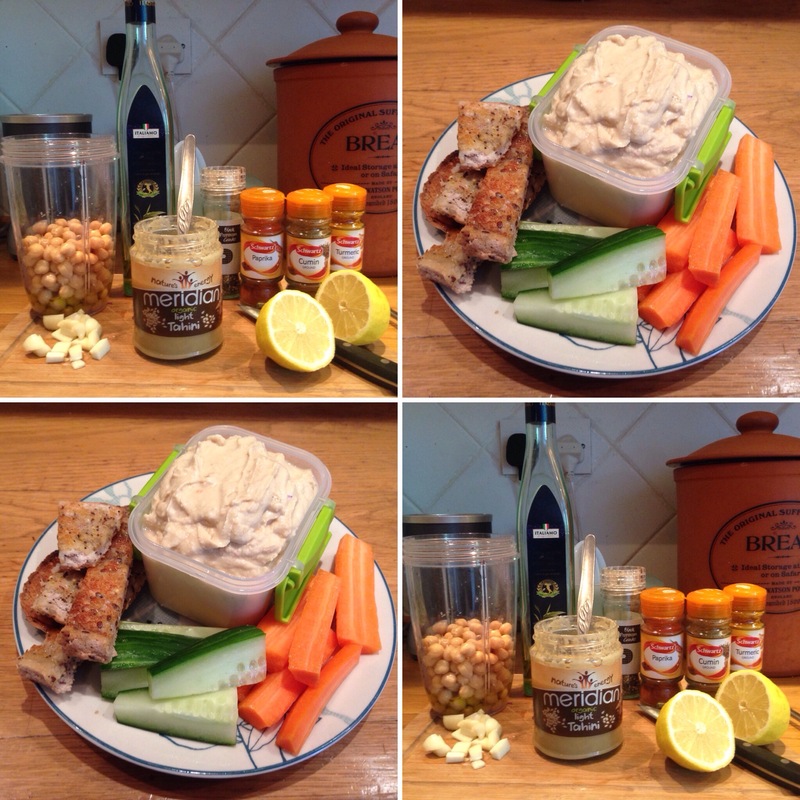 Houmous that Packs a Punch! I’ve finally got my houmous mix down! It’s always been too bland in the past but the answer for me was more garlic and lemon. If you like it strong then you may like this variation. I add about half a tsp of each spice. Then just blitz it all up, simple! Warming Spicy Bean Pot – My Most Favoured Dish! It’s wheat / gluten, dairy and sugar free. Plus if you’re a vegan, you’re in luck! 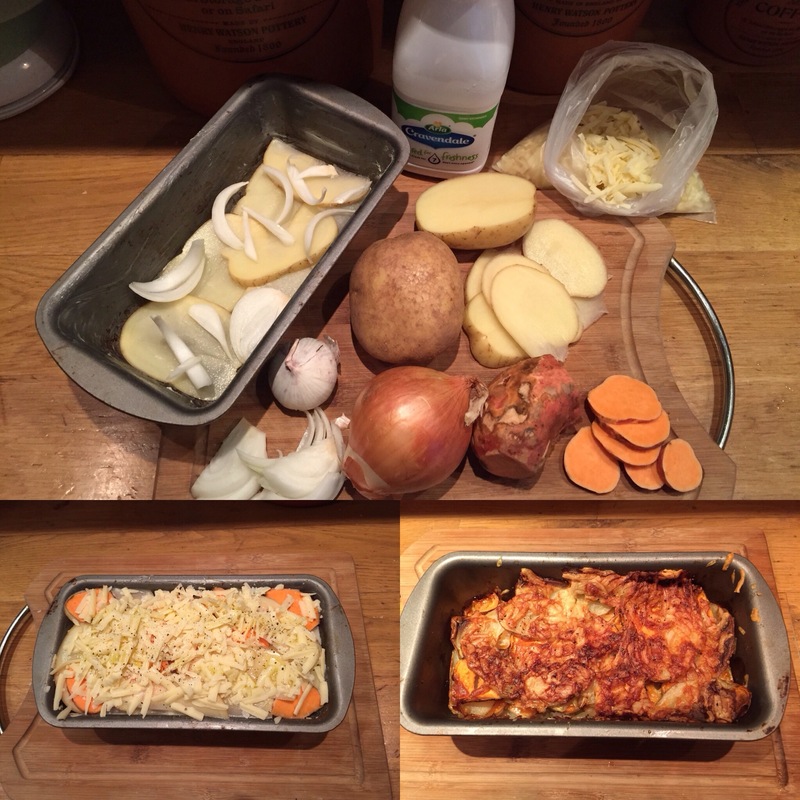 This dish is popular with my family and friends, in fact I’ve given out the recipe frequently so thought I’d add it here. 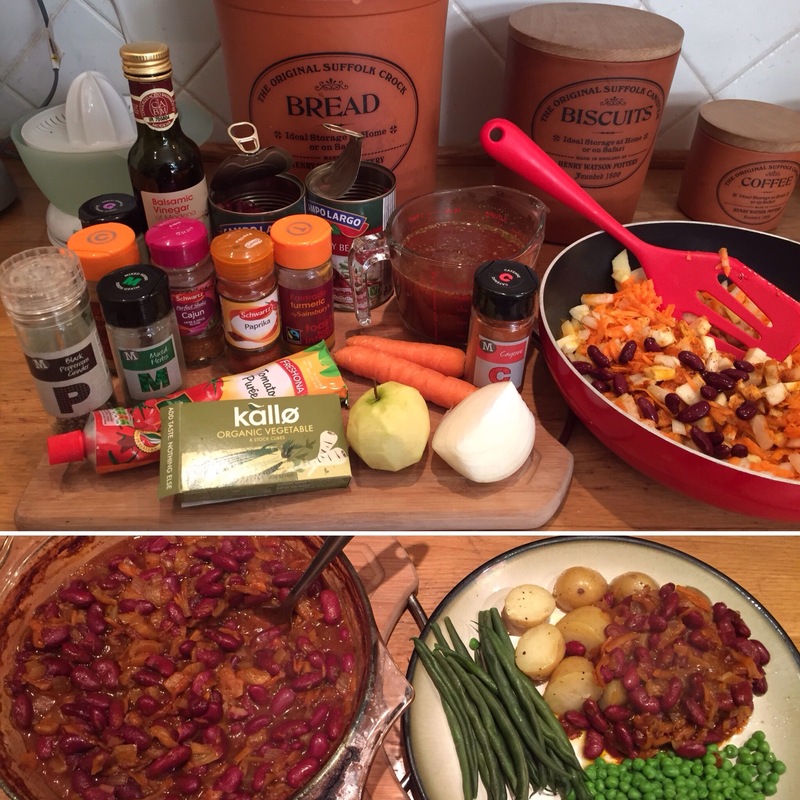 It’s great to make a huge pan full for parties, simply add an extra can or two of beans and top up on the veg. You’d need to cook the double amount in two casserole dishes however. It still tastes just as good after freezing, so you can store portions and eat day after day. It never gets boring and you can make it as hot as you like. You can play with the spices and get it how you like it. I normally drizzle in hemp or Soya milk as an alternative to milk, but I’d run out on a day I just couldn’t resist my potato yearning. 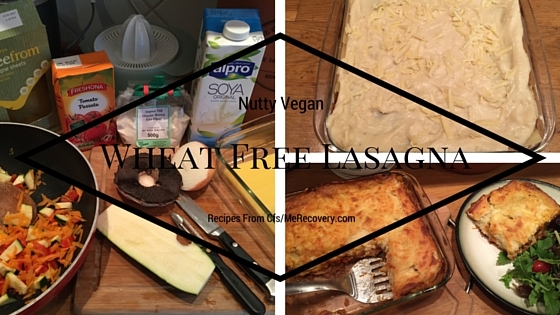 You could also cut the cheese, or use vegan cheese making it dairy as well as wheat free. This recipe fills one loaf tin and feeds two, or just the two inside of you! Simply gorgeous, this is! Nothing like blowing your own trumpet, but I’m sure that eating well, in addition to loving the cooking experience, really adds to recovering our health. Also for those of us who feel great anyhow, it surely sustains vitality. I adore Italian food and it’s been really annoying at times, with eating wheat / gluten free, that I feel I miss out. However I’ve been experimenting more lately with brown rice pastas and homemade sauces, hence my lasagna success. I eat dairy infrequently, so I added some to this bechamuel sauce for a treat, but to be honest, it didn’t need it and so would taste great without. 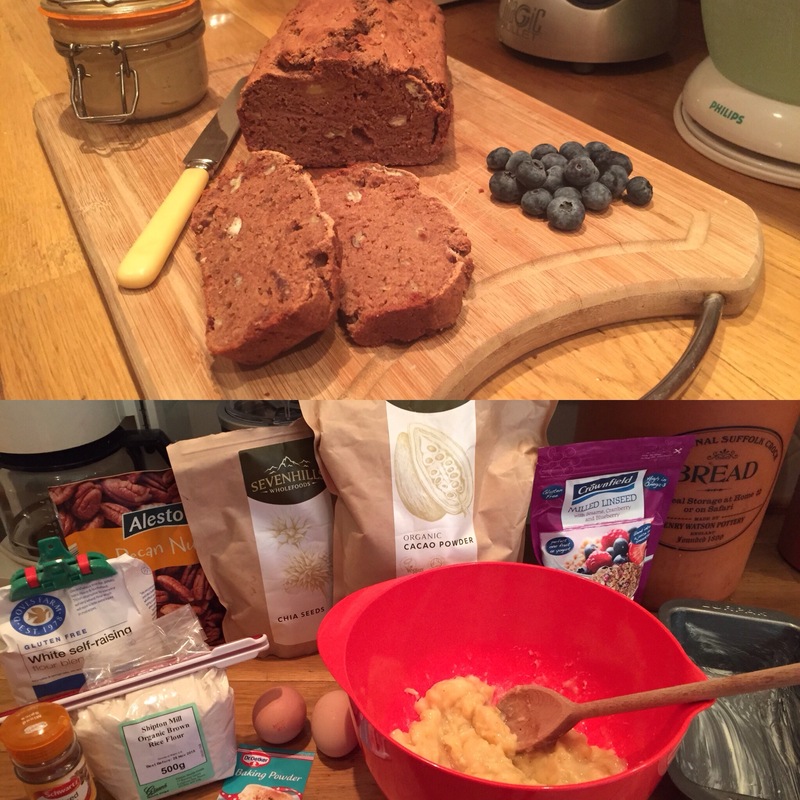 I love to make banana bread and because I’ve been cooking so much with cacao lately, I added it to my latest batch and it’s simply divine. This loaf is wheat / gluten free and sugar free, only gaining the natural sweetness from the bananas. You can even make it vegan, by substituting the eggs for a mix of chia seeds and water. This creates a coagulated mixture, which is a great egg substitute.